I’m one of those people who need coffee and breakfast. Usually I just grab a shake, but it’s not the same. This year I am making time for breakfast, I just want it to be quick (a bit of an oxymoron…I know). 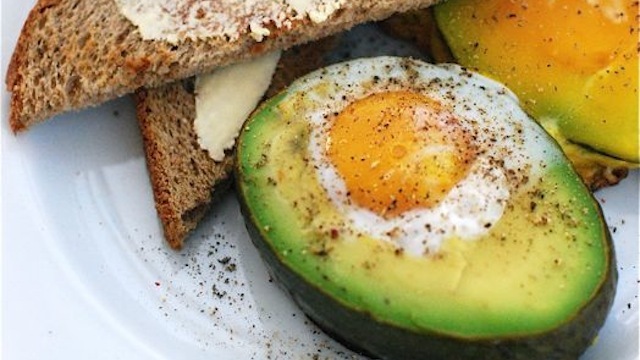 For a powerful punch of omega-3s in your breakfast, try baking eggs in an avocado. Regardless of whether you’re looking for a Paleo powered breakfast, following Atkins, or just sticking with plain ol’ healthy eating, this recipes ticks all the boxes. Beyond the heart-healthy fatty acids and high protein count, this breakfast will kick off your day on a healthy note. And, if like me you’re always rushing in the morning, you’ll be happy to know this recipe requires just two ingredients and no prep time. Remove from oven, then season with pepper or chives.